You and your family are growing both in size and in electrical power needs. As you add more people, appliances, and electrical devices to a home, the power need grows right along with them. This leads to the question, "Is my electrical circuit breaker panel big enough?" More rooms, lighting, and electronic gadgets may add more load to your service panel that it can handle and a service upgrade would be in order. A qualified, licensed electrician can determine the amount of load your panel has on it presently, if you need an upgrade now, and what size is best for you and your family's needs. Simply adding additional outlets and lighting to existing circuit breakers is likely to cause circuit overloads and cause breakers to trip. Lights that flicker and switches that seem hot to the touch in all likelihood are problems to deal with now. Sizzling and/or popping sounds in and around switches mean that the switches are getting bad. Either loose electrical connections or bad contacts are usually the result of these sounds. Be sure you are using grounded switches and that the copper wire connections are attached properly and secure. Hot switches indicate the circuit may have more load that the switch can handle. Remember, if the lighting is on a 20-amp circuit, please use a 20-amp switch, not a 15-amp switch to accommodate the load. If your electronic devices and appliances have ever given you a jolt when you touch them, be sure the ground connection on your cord has not been removed and also check that the outlet has a ground on it. It may be that your appliance has an electrical short to case ground, but the device doesn't have a path to ground through the wiring. If so, you may need to call an appliance repairman to determine the extent of the problem and possibly an electrician to update the wiring and devices in your home. It could be as simple as a burnt oven element laying on the oven base causing such a problem. Circuit breaker sizes and wire sizes go hand-in-hand. Never connect an electrical wire with an amperage rating less than the circuit breaker that is protecting it. For instance, if a wire is connected to a 20-amp circuit breaker, it needs to be rated for 20 amps also. Look on the outer sheath of the wire to determine what wire size it is. 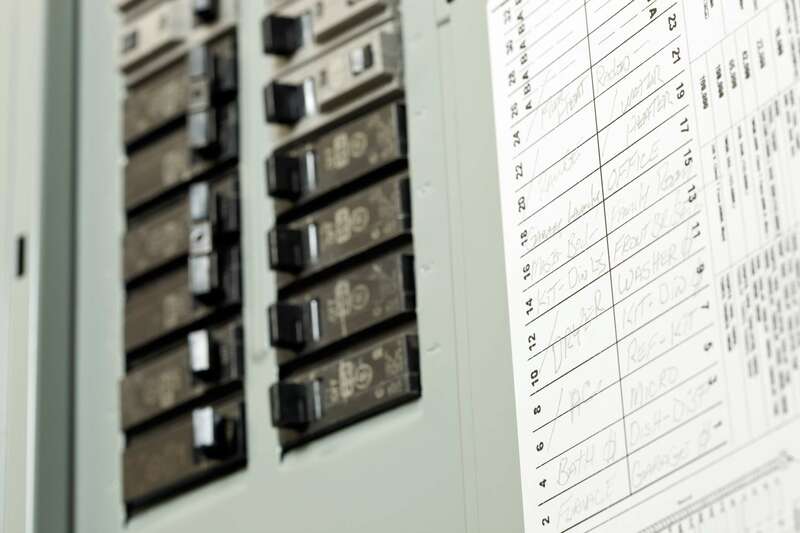 If a circuit breaker trips or a fuse blows, you can bet there is a problem somewhere. Continually resetting breakers and replacing fuses is not the answer to your problems. In fact, you are likely to have an electrical fire if you don't address the problem. GFCI breakers can be used on circuits exposed to weather and areas prone to water. Ground fault circuit interrupters, called GFCI's, are used in bathrooms, kitchens, laundry rooms, basements, garages, and outdoors to protect the person using them. If there is a difference of potential in the circuit, the GFCI will trip and open the circuit so you won'r get electrocuted. They come equipped with a test and also a reset button. Monthly checks should be made to test the GFCI's for functionality. Light bubs can cause their share of problems in a home. Putting a bulb with a wattage too large for a socket is a problem. Always be sure the bulb is screwed into the socket securely. Loose connections between the bulb and its contacts cause the bulb, socket, and wiring to heat up, causing bulbs to burn out quickly and can lead to electrical fires. Wire insulation can break down when overloaded. You can replace regular incandescent bulbs with compact fluorescent bulbs (CFL's) that not only use a fourth of the energy incandescent bulbs do, but also last upto ten times as long. Electrical cords and plugs can be a safety issue. Check cords for cuts and defects. Plugs should be equipped with a ground pin. If the ground pin has been cut off or removed to fit into a two-conductor, non-grounded outlet, replace the plug or throw away the cord. Replace the outlet to accommodate the grounded cord plug instead of removing the grounding pin for your safety. Extension cords are great temporary extensions of a circuit. They are not, however, intended for permanent circuit feeds for household appliances and devices. If you are feeding a major appliance with an extension cord, be sure the cord is heavy enough to handle the load of the appliance. Light duty cords cannot and should not be used. Consult your neighborhood appliance center to determine the appropriate sized cord for this installation need. Outlets can become a problem when the contacts become weak and cords start falling out of them. The fingers inside have a certain tension rating that is required to hold the plug in place. You can buy a tester that checks this tension and gives you a heads-up on whether your outlets are defective. Check for loose electrical connections to the terminals of the outlets and never use the push-in terminals. Replace cracked or broken outlets and wall plates. These can expose connection points and wiring to everyone in the home, especially children. Portable generators are a God-send when the lights go out. Severe storms cause havoc on power lines and often lead to power outages. Portable generators can provide the power needed to run your home. Electrical safety measures should be followed to allow safe power to your home and safety to others down the line. Be sure your generated is properly grounded. Always use a transfer switch to connect the generator to your service panel. You see, a transfer switch allows the power to be fed for either the utility company or your generator, not both at the same time. That way, you cannot back-feed power down the utility line, potentially setting up a death trap for the lineman working on the power lines. Overhead power lines have some strict guidelines for height clearances over streets, sidewalks, alleys, roads, and driveways. The National Electrical Code (NEC) mandates acceptable clearances for power lines to keep the public safe from coming into contact with them. Spring and summer storms spawn thunderstorms which produce lightning. Lightning can cause severe damage to a home without the addition of lightning rods to funnel the full force of its destructive powers to ground. Find out why lightning rods can save your home. Electrical wiring defects and connection problems cause electrical fires. Be sure to check for loose connections in junction boxes, on switches and outlets, and also the connection points in your electrical circuit breaker panel. Another potential problem area is lighting fixtures. Light bulbs too large for light socket capacities, loose connections, and defective fixtures and cords can all cause problems. Sizzling and/or popping sounds in and around electrical devices are good signs that something is wrong. If you hear such a sound, turn that circuit off immediately and call a qualified, licensed electrician to find the problem. Check the electrical wire size to determine if it is sized appropriately for the circuit breaker.